Au is sitting down to his third breakfast this morning - and it's not even 8 o'clock yet. Our small fuzz is not happy with his cat biscuits. The manufacturer has improved the flavour but Au prefers the old inferior one. We're planning a biscuit buying expedition later this morning. Au is a little sensitive about small things at the moment and we're indulging his every whim to the hilt. It' s been three weeks since his colleague Scoop passed away and our Mr Kitty still misses his big brother. Once he's cleaned his whiskers and his breakfast has settled we'll spend some time playing in his cardboard box. I've got a great idea for a new game he might like. PS Scoop and Au in bed. 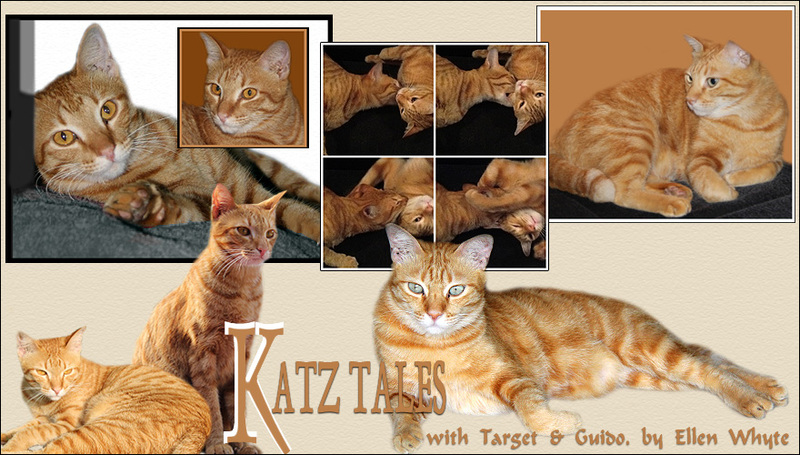 PPS Katz Tales is out in the print version of The Star today! You guys look so comfy! Hold out for the good biscuits too! What a cute photo! I love seeing the 2 kitties. Does Au need a new friend in the house? A look at this pic on a cold rainy day will give you a warm fuzzy feeling all over!! As I've followed the 2 kitties' adventures for quite a long time, something just struck me...if you ever think of getting a new kitty in the future, rest assured that Au will know what to do. His big bro has trained him well & that's a big legacy left behind. Kitikata, Dizzy... the time will come but not yet.